American consumers and businesses became more cautious with their investments following the recession. But one prominent member of the Federal Reserve thinks a return to risk-taking could be healthy for the U.S. economy. Janet Yellen, vice chairwoman of the Federal Reserve, said Monday she hopes that low interest rates will succeed in promoting a "return to prudent risk-taking." "The return to more normal levels of risk-taking and the associated normalization of credit markets have been vital to recovery from the Great Recession," Yellen said at a National Association of Business Economics conference in Washington. Those comments echo those of Federal Reserve Chairman Ben Bernanke. In a late-night speech Friday, Bernanke said the Fed's latest stimulative policies are aimed to "prompt a return to the productive risk-taking that is essential to robust growth and to getting the unemployed back to work." In its effort to boost the economy, the Fed has kept its key interest rate near zero since 2008. To lower rates even further, the central bank has also been buying Treasuries and mortgage-backed securities, a program known as quantitative easing. Those policies, which are meant to spur spending and lending by banks, have a secondary effect of driving investors away from low-yielding Treasury bonds in search of higher-yielding assets like stocks. To that end, the Dow and S&P 500 are not far from the all-time highs they set in October 2007. Observers, even including some Fed officials, have recently argued that the "reach for yield" could be fueling a bubble in certain types of bonds, farmland, and other assets. Bernanke and Yellen have nodded to those critics, admitting that risk-taking can sometimes go too far. But they also argue that the benefits of a stronger economic recovery outweigh risks of asset bubbles. "At this stage, there are some signs that investors are reaching for yield but I do not now see pervasive evidence of trends such as rapid credit growth, a marked buildup in leverage or significant asset bubbles that would clearly threaten financial stability" Yellen said Monday. Yellen also noted that the Fed should continue to keep rates low until the job market improves, saying that improving the job market should take "center stage" in the Fed's policies. The unemployment rate has been stuck above 7% for four years straight, and according to the Fed's own projections, it's not likely to fall below that level until at least 2015. Yellen cited an economic simulation model that suggests when the Fed buys $500 billion in bonds, it lowers the unemployment rate by a quarter of a percentage point within a three-year period. The Fed has already purchased more than $2 trillion in Treasuries, mortgage-backed securities and agency debt since 2008, and it continues to buy $85 billion more in assets each month. Critics worry that once the economy eventually starts to heat up, the Fed may not be able to sell off assets quickly enough in time to avoid rapid inflation. But Bernanke and Yellen have said that the level of robust growth needed to fuel inflation is not likely to happen anytime soon. They also pointed to stronger housing and auto sales as signs that their plan to boost the economy is working. 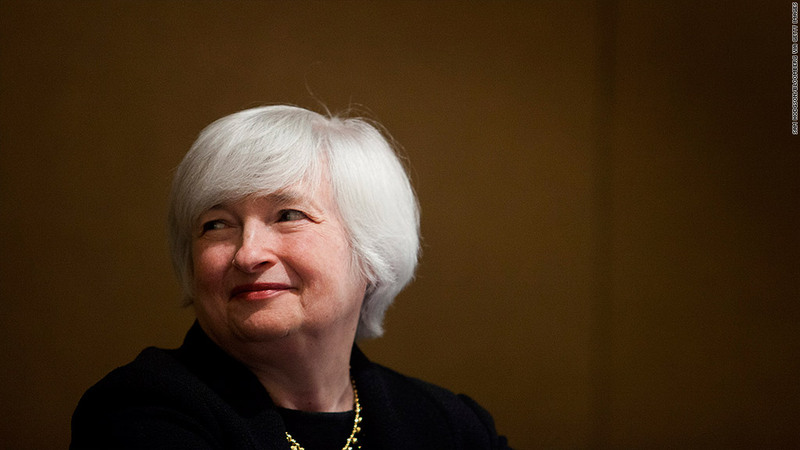 Yellen said Monday that the Fed's purchases have "been reasonably efficacious in stimulating spending."